Summer is the only season one can relish fresh homemade ripe mango juice and I make best use of our home grown mangoes. ‘Suvarnarekha’, a variety of sweet mango is best suited to prepare mango juice. Its pulp blends well to yield a smooth creamy juice. Peel and chop ripe mango into pieces, place in blender with crushed ice, water and sugar OR honey OR date syrup as required. Blend to a smooth consistency and run through a sieve. Discard the left over pulp in the sieve. Pour into tall glasses and serve. Have mango juice anytime, truly tempts me a lot..
What an ectasy!!! Simply lovely and wonderful. Would do this for the weekend party! Thank you..!! 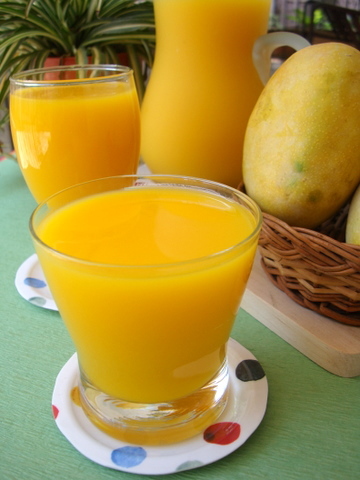 Lovely color of the mango juice….luv mango in any form! mango juice looks lovely…so tempting! I like to eat mangoes than in a puree form, not sure why I don’t like them in puree form. But, this looks simply delicious 🙂 I am also “trying” to grow mango tree, still unsuccessful. I keep planting the seed everytime I use mango. Any tips? Mmmmmmmm, that looks simply delicious! to have fruit n veggie trees/plants at home. I assume you have some veg garden too? It’s so nice to go pluck veggies and cook em fresh. friends and relatives who share their bounty with us. I love mango julice! 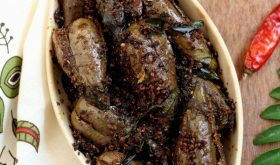 Reminds me of Mangola from the motherland, great recipe! Mangoes are my all time favourite and this juice looks really tempting. I haven’t heard of this variety before. I am not sure if I can find an equivalent here in the US. Can you post buttermilk recipe also? i think this sounds weird but my husband always complains about the buttermilk which i made. he likes the Amul buttermilk, I think they add some spices to get that taste. Can I add yogurt to this? Add 1 1/2 tbsps of yogurt for each glass of mango juice. Can you use fresh dates instead of date syrup? Yes add 1 to 2 dates for each mango depending on the sweetness of the ripe mango. just had a glass of mango juice from raga restaurant. How many cups of water should I use for a tall glass of mango juice? Blend the mango pieces. Add few tbsps of water at a time and blend. Add enough water according to the thickness of the juice you desire. 1/2 cup of water to a medium ripe mango should do. Nice , Simple , Cool , mango drink .. Thanks for this recipe ……. would little kesar be gud with it? There is no need for kesar. Is there any special technique to getting as much mango meat off that big seed? It’s usually stuck pretty good on there. No special technique as such. Use your hands to squeeze out the pulp.